“Historical” is one way to describe a 9-mi. Southwest Gulf Railroad Medina Line track and facilities project now under construction near Dunlay, Texas, west of San Antonio. Short line railroads, which initially delivered both goods and passengers, were a major part of the history of early-to-mid 20th century rail service in the United States. Now short lines are making a substantial comeback. They operate nearly 30 percent of the nation's total railroad mileage, comprising more than 50,000 mi. of railroad track. The Medina Line will be the 17th short line railroad in Texas. Short line railroads serve more than 13,000 customers and haul more than 14 million carloads per year. The Medina Line will provide direct delivery of goods to factories and other businesses along and near its 9-mi. course. There are no plans for the Medina Line to carry passengers. The Medina Line project started in August 2017 and should be completed by 2019. Southwest Gulf Railroad Co. declined to provide a cost estimate for the project, but it is expected to be in the 10s of millions of dollars. 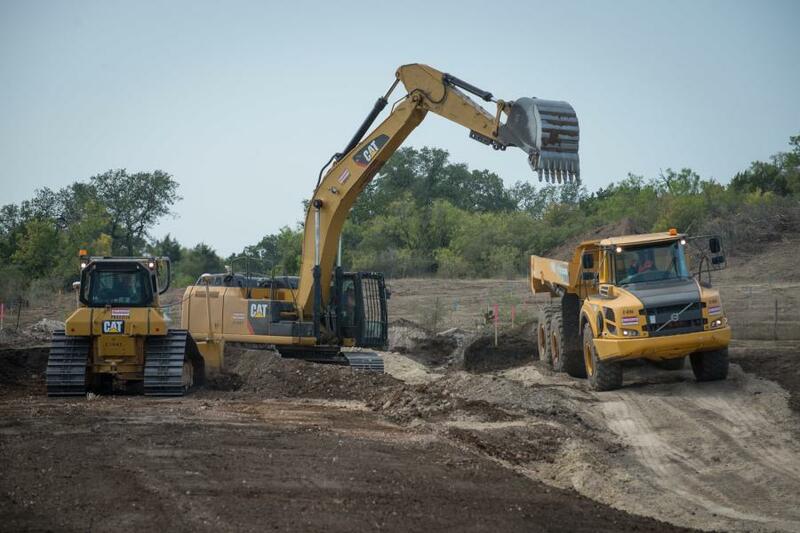 Vulcan Materials Co.'s Medina Quarry, an existing limestone quarry at the northern end of the Medina Line, will be the railroad's initial anchor customer. Other items to be transported would be dependent on the businesses that develop on or near the Medina Line. Southwest Gulf Railroad is actively seeking partners for development opportunities along the line. Services offered by the Medina Line include customized rail, railcar switching and transloading. The line will help take trucks off the road, which will reduce carbon emissions. One rail car can carry cargo 436 mi. on a single gallon of fuel. The railroad is connected to the Union Pacific and Burlington Northern and Santa Fe railroads, providing access to the entire country. The Medina line is located 30 mi. west of San Antonio along U.S. Route 90. In 2008, the U.S. Surface Transportation Board granted Southwest Gulf Railroad authority to build and operate the Medina Line. provide local businesses with a low-cost and convenient connection to the regional, national, and global marketplace. The Medina line is now moving into the fourth and fifth phases of the five-phase project. Once operational, the developers expect the line to be well-accepted. They describe it as an efficient time saver. Medina Line's plans to carry goods a short distance is nothing new. It was common during the early days of United States trains but disappeared during what is known as the standard era of train travel from 1912 to 1940. From the mid-century forward, 18-wheeled trucks handled most direct delivery of goods. But with new short lines, like the Medina Line, some of the tried and tested ideas of earlier rail lines will be used again. Determining that the project was in the public interest, in 2008 the U.S. Surface Transportation Board granted Southwest Gulf Railroad Co. the authority to build and operate the line. It will operate 30 mi. west of San Antonio, north of U.S. Route 90 in Medina County. It will provide local business customers access to the regional, and global marketplace through low-cost and convenient transportation solutions. With the rail line now under construction, Southwest Gulf Railroad Co. and Union Pacific Railroad are working together to actively market the Medina Line and development opportunities to customers. Union Pacific is the nation's largest freight railroad connection the West Coast to the Midwest. As a common carrier, the Medina Line is available to serve businesses located on or near the line. The line will offer customized rail, railcar switching and transloading service. 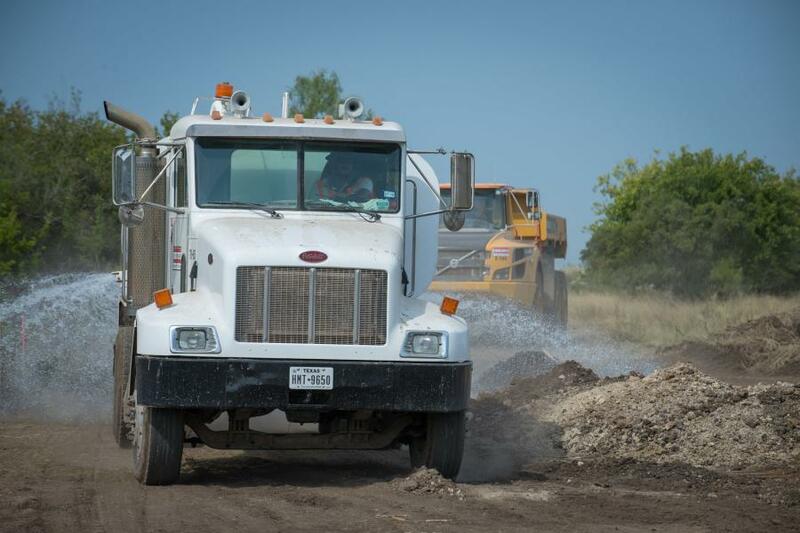 The line's initial anchor customer will be Vulcan Materials' Medina Quarry, an existing limestone quarry at the northern end of the line operated by Southwest Gulf Railroad Co.'s parent company, Vulcan Materials Company. Vulcan's coast-to-coast footprint aligns with and serves the nation's growth centers. Through the company's extensive logistics network, Vulcan provides materials to build and repair valuable infrastructure such as roads, bridges, residential and commercial buildings, schools, hospitals and places of worship. 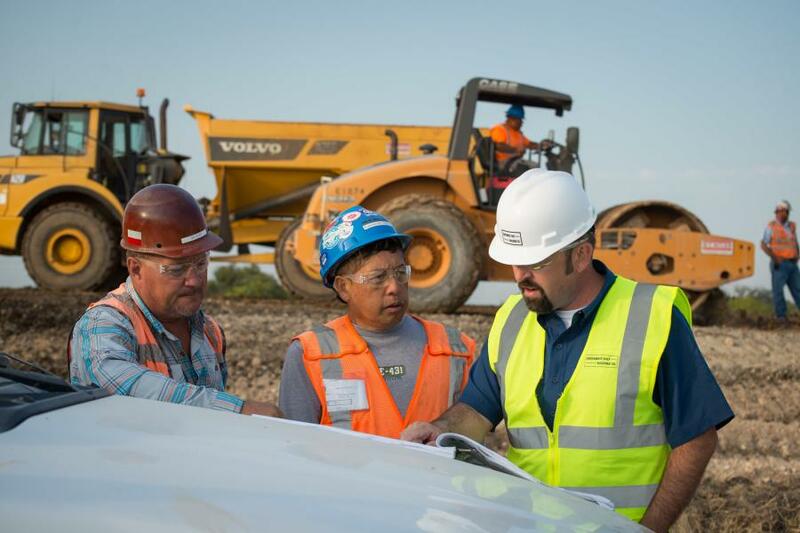 To serve Vulcan Materials' Medina Quarry, it is expected that each 100-car train will run once or twice per day, the equivalent of taking nearly 1,000 18-wheeler trucks off the road per train trip. Trains for the new line will be either purchased or leased. The current workforce is 70 to 80 workers spread out along various parts of the 9-mi. route. Project team members include Erik Remmert, vice president, Barton Chevreaux, project manager and Cynthia Preto, community liaison, all of Southwest Gulf Railroad Co., which has a Medina County office in Hondo, Texas. General contractor is WT Byler Co. Inc. of Houston. The company is experienced in railroad construction, having constructed hundreds of miles of railroad in Texas and Louisiana. The Medina Line project will use local workers whenever possible. It also will use local materials and services when building the railroad line. WT Byler has been accepting applications for heavy equipment operators and laborers. The company has subcontractors on duty including experienced crews for the bridge and fence work. Construction of the project began with surveying which lasted two weeks. In Phase 1 a small crew worked to establish the right of way. Markers were placed in 25- to 50-ft. intervals. In second-phase work, crews cleared the right-of-way perimeter and installed fencing to establish the right-of-way boundary. Crews will remain in the right-of-way for the duration of the construction process. Phase III involved earthwork. Working generally from a south to north direction, crews performed cut and fill work along the route. Under Phase IV, site work begins. It includes installing base material along the route. Site work will last about six months. Phase V features building the rail. Crews will install rail, ties and ballast along the route and construct seven road crossings. Southwest Gulf Railroad Co. will install electric warning signals and gates at the roadway crossings. About 1,900 tons of steel rail will be laid over the course of the project. 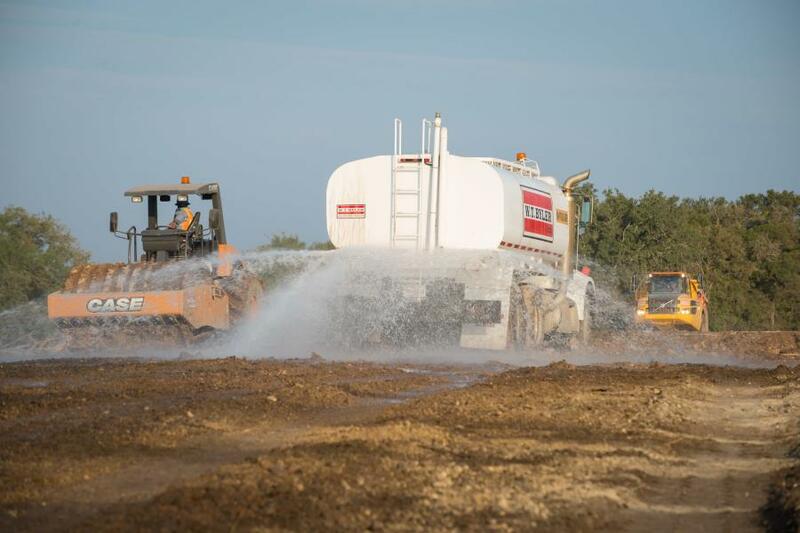 Equipment includes nine 470 Hitachi excavators; one 349 Cat excavator; three 336 Cat excavators; 12 D6N Cat dozers; six D6T Cat dozers; four 745 Cat off-road trucks; 23 25-ton Volvo off-road trucks; five Sakai 84-in. compactors; two Case 84-in. compactors; one 140 Cat blade; two Cat loaders; two John Deere loaders; and five Peterbilt water trucks. On its webpage, Southwest Gulf Railroad reported that it is committed to Medina County and looks forward to working with the community to generate new jobs, new tax revenues and economic growth for the county and its residents while providing local businesses with a low-cost and convenient connection to the regional, national and global marketplace. The Southwest Gulf Railroad Company plans to keep local communities connected to the national rail network through America's heartland. The company provides local business customers access to the regional, national and global marketplace through low-cost transportation solutions. The Medina Line will serve as a catalyst for new jobs and long-term economic opportunity in Medina County and Texas. The line is expected to generate new tax revenues for vital government services, including road construction and maintenance, schools, and public safety. It also will provide local businesses with a connection to the regional, national and global marketplace. The line will partner with local business and economic groups as part of GoMedinaCounty.com to foster economic development and jobs. Unlike Class II or Class I railroads, trains on the Medina Line are expected to travel at an average speed of 20 to 25 mph. In addition, the track will use continuously welded rail, commonly called ribbon rail and track lubrication to minimize noise. The rail line also has a plan to minimize dust. Southwest Gulf Railroad Co. will maintain a dust control plan, including the use of water trucks. It also will implement best management practices to minimize the impact of air pollutants. A few railway crossings will be temporarily closed for construction. The line has a total of seven crossings. The rail line will report road closures in advance to neighbors and stakeholders. Closings will be publicly posted via road signs 14 days in advance. The Medina Line will create approximately 200 construction, engineering and operations jobs over a two-year construction phase. Businesses that locate on or near the Medina Line will create additional jobs and opportunities for longer-lasting economic development. The line will generate new tax revenues for vital government services, including road construction and maintenance, schools and public safety. Businesses that locate on or near the Medina Line will generate additional local revenue through increased household incomes and spending at local suppliers, stores and restaurants. The project also will enhance transportation infrastructure. And by strengthening transportation infrastructure, Southwest Gulf Railroad Co. expects to help the county attract new employers.